A visual playground for adults and a fun fairy tale for kids, Guillermo del Toro's "Trollhunters" is worth tracking down. Guillermo del Toro is a visionary. The director behind “Pan’s Labyrinth,” “Hellboy,” “Pacific Rim,” and more has never failed to astound us with the visual presentation of his pieces. So creative and bold is the detail-orientated filmmaker that his work was recently on display at the Los Angeles County Museum of Art as a temporary exhibit. No one has ever questioned del Toro’s eye, so his first foray as a creator and director in the animated world set expectations fairly high. Sure, children’s entertainment doesn’t get the same kind of buzz as its adult counterparts — when was the last time you got excited about a kids show, other than “The Adventures of Puss in Boots”? — and del Toro’s first credited creation for the small screen (“The Strain”) didn’t exactly set the world on fire. But “Trollhunters” promised an opportunity to see how the director would apply his vision to a style that demands everything be built anew, from nothing. For the most part, “Trollhunters” pays off. Helped by a formidable team of animators at Dreamworks Animation, the new series is a treat to behold. While a simple story drives things along, the impressive visual flair del Toro brings — as well as enticing teases toward vast world-building to come — prove compelling for fans of the creator (who also directed and wrote for the series), animation enthusiasts, and, of course, those valued kid viewers. 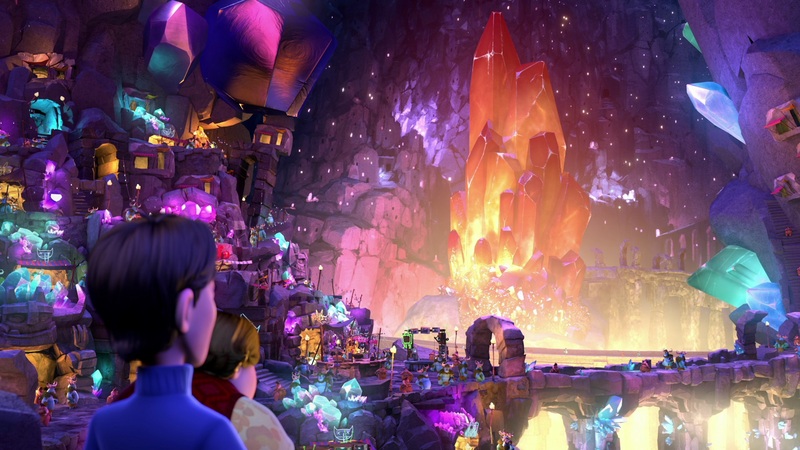 Opening on a battle under a bridge between two trolls (but without any obvious jokes about the setting’s relevance), “Trollhunters” focuses on Jim Lake Jr.’s discovery, exploration of, and education in a world hidden just out of sight: the world…of trolls! After discovering a mystical amulet left behind by the defeated troll, Jim assumes the mantle of Trollhunter, a protective position meant to keep the bad trolls at bay and the good trolls safe. Typically, a troll assumes the role, but for some reason the amulet chose Jim (Anton Yelchin). The troll designs are some of the most pleasing parts of the series, as each big beast gets loving attention to best convey personality through physicality, but the world being built with this ambitious animation is thoroughly intriguing. When the story sags into predictable arcs, viewers of all ages should be more than fine to go along with it thanks to the impressive artistry at play. And they’ll be glad they did once the show starts expanding on its mythology. Bolstered by a strong cast overall — del Toro favorite Ron Perlman is particularly delightful as the big bad troll — it’s worth spotlighting Jim. The tragic backstory of the series is its lead vocal actor, Anton Yelchin, who passed away after he’d completed most of his recordings. 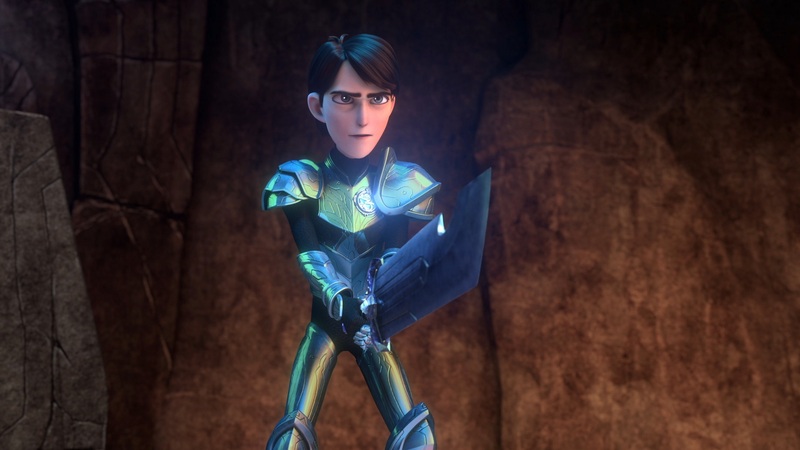 “Trollhunters” marks the talented young actor’s final role, and our great loss is emphasized not only by the excellence of his work, but the nature of it. Yelchin always looked young — younger, even, than he really was — and many of his roles were either carefully chosen or purposefully built to make him seem older. From the mature nature of “Like, Crazy’s” central romance to armoring up for action in “Terminator Salvation” and implementing an accent into his “Star Trek” character, Yelchin’s boyish looks were pushed aside as he submerged himself in the roles. The opposite applies here. As a teenager, Yelchin’s voice sounds aptly youthful: energetic, curious, and innocent. His inflections help build the character instead of merely serving the script, and his performance should be commended for it. It’s a testament to how much he’s able to build that even with Yelchin fully embracing a side of himself oft-repressed in past parts; it’s not distracting to the project as a whole. One might sadden when hearing his voice and coming to the aforementioned realization, but Yelchin only brings out the best from “Trollhunters” in the end. So does del Toro. Be it his eye or his heart, the creator’s first animated endeavor is easily in the upper half of his efforts. It may not end up in a museum any time soon, but “Trollhunters” will delight anyone who visits.